This small Thaumcraft Addon has been written in the process of learning general forge modding and especially how to work with custom block models. Expect additional decorative blocks in the future. You have to do the thaumcraft research before you can craft them. Turn all blocks on and off by rightclicking them with a thaumcraft compatible wand. If you have any suggestions or critique, write them down in the comment section. Using this mod for my mudpack Spice O' Life, which will be releasing within a week. I love the decorations you added and can't wait to see what you add next. I understand that you're going for a Bachelor's in Computer Science or Software Engineering. I'm currently going for Computer Science, but I wish you best of luck for your degree. Anyway, great thaumcraft addon! any new update ideas or plans? Nope, sadly not. The actual problem is : I am not able to find time for modding anymore, or even playing MC. Are you still planning to update this mod? I really do like it, but I am well aware that sometimes life happens and plans just have to change. After I am done with my graduation I will reconsider if I want to continue this mod or not. Thanks for these awesome mod! Hello Jhary, I was wondering what your modpack policy is? I am planning on including it in my modpack. Please let me know if it's ok or not. More "furniture" that matches the aesthetic of thaumcraft tables (& arcane worktable, deconstruction table) so people can fill out their themed rooms with more stuff that matches. One that looks reminiscent of the regular Thaumcraft Table, but more "grand"
One with a top that looks like a massive greatwood log, maybe by right clicking a 2x2 section of Greatwood Logs with an un-focused wand? Lighter, silverwood-based options for stuff -- perhaps list the fact that it's silverwood as a "lore"-type tag underneath the item name? Or they could just be exactly the same except in visuals, differentiated by the name of the mod underneath them. Magia Naturalis has the right idea for better, silverwood-oriented things that aren't completely reminiscent of default Thaumcraft's terrible texture for the planks. Lamps that are reminiscent of the Infusion Altar in some way -- perhaps a miniaturized version of the four pillars, without the central pedestal, and with a light instead of the Runic Matrix. Decorative tallow candle holders, 2 blocks tall, on the floor. Votives -- maybe a candle and a glass bottle? A Greatwood Planks variant (maybe with less than 1 Terra in an arcane table) that is closer to what the top of a greatwood log looks like, than what Thaumcraft's Greatwood Planks look like. A flat lamp with the same size/model/hitbox as a trapdoor; made with amber, nitor, and thaumium ingots(or arcane stone? regular stone?) Kind of like this(kinda shown: thaumium edge, amber center), the recipe would make several (4? 8? 16?). Would be place-able on the top or bottom of its space, like trapdoors, maybe (if possible) a third case of having it align to the edge of a slab if you placed it on the side of one. "Recessed lighting". Iron bars, but thaumium. Maybe prettier. More.. just decorative doors, really. Could be crafted with regular oak door + various things. Flowerpots? Arcane stone flowerpots? Flowerpots that allow ethereal blooms to still have their effects, that allow sheared shimmerleaf and cinderpearls to still emit their light? I can't remember if those have particle effects or not. Would probably want to avoid being too similar to Garden Stuff in some regards. Traveler's paving stone variants? Slabs? Bonsai greatwoods/silverwoods? The latter possibly with an equal chance of "generating a node", but it wouldn't be a true node, it would just be "this tiny tree contains and regenerates up to (let's say) 2 vis each of its random set of aspects, and can give those to wands being right clicked on it". Could also change biome in a tiny area (2 blocks? 1?) to magical forest. 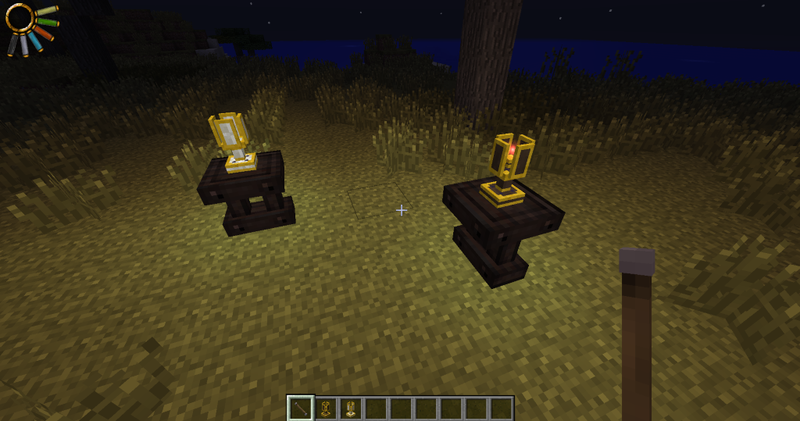 Arcane Pedestal variants, still functional. Glass variants? Warded Glass variants? Various inventories, perhaps with less slots than chests? This pool cue rack, but the center stores wands and foci, and the sides store staves/scepters. Displays relevant items (in 3D) and models. Craftable versions of the loot crates/urns that are in modern thaumcraft dungeons, with small inventories. 1 slot, perhaps holds a lot more of an item though? Like small barrels. an Arcane Worktable with a small drawer in the bottom, that also shows up in a custom reworked GUI. 9 slots? 18? A Greatwood planks barrel, that's a 16000mB fluid tank. Like Growthcraft's but different. Ooookay thats some serious "wall of suggestions" ;) At first, thanks for your additional input, I really appreciate that. You have some very good and interesting points on that list, noted them all down. Now that all my exams are gone, I am able to focus again on the mod. Keep an eye on it during the next week or so, will do some work on it in the next days. * targeted the top, bottom, or side of another instance of the same lamp. And I don't mean that it would detect what solid blocks it's next to. That'd be significantly less useful. I was thinking (for "target the top of another lamp") that it would be nice if it made the central post taller, like this terrible mspaint mockup I just made. Only the highest one would emit light. maybe some type of lamp that uses the eldrich guardian projectile or alumentum after being thrown, that kind of effect. also, some sort of really efficient infusion stabilizer (up to you to decide what). Thanks for your suggestions :) The different light particle types sound like a good idea, I will look into that. Regarding the stabilizer, as far as I know there is no way of making a stabilizer more efficient. All stabilizers count the same, at least its that what I found.